Description: An interactive resource guide that helps Michigan families find the right resources for their children with disabilities. The guide includes easy-to-navigate resources related to treatment, care, education, finances, and more. Description: Cerebral Palsy Guidance was created to provide answers and assistance to parents of a child with cerebral palsy. Provides the public with accurate and up to date information on the many aspects of cerebral palsy and associated disorders from symptoms, causes, and treatment, to daily living information, such as communication and transitioning to adulthood articles. Contact: (866) 579-8495 or Contact Form through website. Description: A FREE nutrition education program that offers training in basic nutrition, meal planning and preparation, stretching dollars, food safety, healthy eating and feeding infants and children. Eligibility: Low income residents of Ingham County with children 0-19 years of age. Description: Developed through a partnership of local school districts and the Ingham Intermediate School District (ISD), the Family Learning Connections was created to help parents stay connected to their child’s education. It provides information and resources to parents that can help support your child’s education at home and their overall experience and achievement in school. Parents can search by a specific grade (birth to grade 12), subject (math, reading, or behavior), and topic. Description: Meetup is the world’s largest online network of local groups. Meetup makes it easy for anyone to organize a local group or find one of the thousands already meeting up face-to-face. How to Use: Click the link above. Type in Lansing or your zip code into the search bar. You can also type in keywords such as “parenting,” “playgroup,” “moms,” or “dads.” There are already groups set up in the Lansing area, but you can also start your own group. Description: Great Start To Quality is the best place for families to search for quality licensed preschool and child care for children (ages 0 to 12). Services: Every licensed and registered program and provider is listed in an easy-to-use search engine including Head Start and Great Start Readiness Programs. Families can search by zip code, hours of operation or something even more specific. If a child has a food allergy or a special need for example, families can search using that detail and find a program that meets their needs. Description: This website provides information about preschool program options, many of which are tuition free. The application on the website is the first step in the process for families to apply for preschool placement for their child and helps connect families with the program they feel best meets their families’ needs. 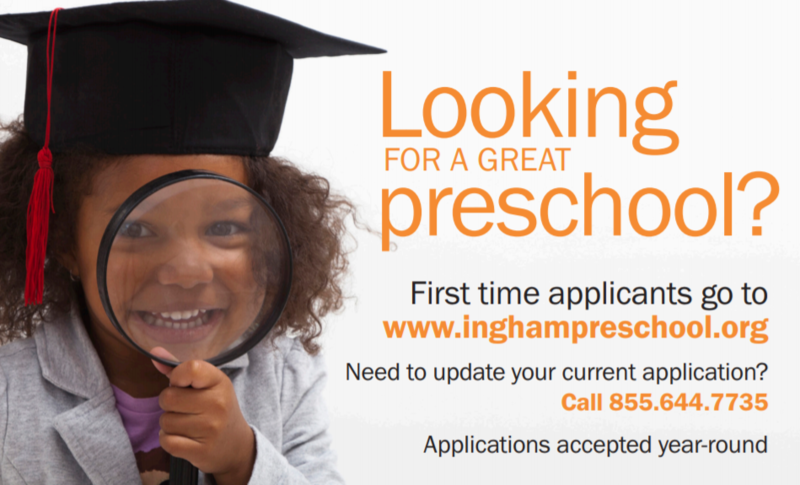 A preschool application can also be completed by calling (855) 644-7735 (interpreters available). Completion of this preschool application does not guarantee a program placement. Eligibility: Children who turn three years old by September 1 of the upcoming school year and meet income guidelines are eligible for Head Start placement. Children who turn four years old by September 1 of the upcoming school year and meet eligibility guidelines may be considered for Head Start or Great Start Readiness Program placement. Description: A coalition of human service agencies, coalition of parents, and other partners working together to develop a system of early education and care providers to support children and families in Ingham County. Meetings: The Ingham GSC meets monthly on Wednesdays from 1pm-3:00pm at Grace United Methodist Church (1900 Boston Blvd, Lansing, MI 48910). FREE licensed childcare is available during meetings at the Family Growth Center (549 East Mt. Hope Avenue, Lansing, MI 48910) by advance reservation only. For a complete list of meeting dates and for more information about childcare, please see website. Get Involved: Visit our website to learn about Ingham GSC workgroups, the Early Childhood Action Agenda, and other efforts to advocate on behalf of young children in Ingham County. All are welcome to attend meetings. Description: A network of parents, parent groups, parent organizations, and caregivers of young children willing to help, plan and support the Ingham Great Start Collaborative (GSC) efforts. The members of the Family Coalition serve as key contacts to a broad range of parent groups in order to facilitate the exchange of information between parents, parent groups and the Ingham GSC. Meetings: The Ingham Family Coalition meets monthly in the evening at The Family Growth Center (549 East Mt. Hope Avenue, Lansing, MI 48910). For a complete list of meeting dates and times, please see website. Dinner along with FREE licensed childcare through the Family Growth Center is provided during meetings with advance reservations. 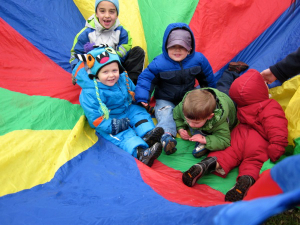 At the meetings, we share resources about early childhood education, get up-to-date information on community events in Ingham County, and have candid discussions about various topics chosen by parents and other issues of interest (Parent Café). Get Involved: Visit our website to learn about the Ingham Family Coalition. All parents and caregivers of young children who live anywhere in Ingham County are welcome to attend meetings. Description: The Kinship Care Resource Center provides support for the physical, emotional, cultural and social well-being of kinship families in the state of Michigan. Services: Linking families to community resources, providing kinship care related technical support and consultation to agencies. Description: A nonprofit health organization that focuses on improving the health of babies by preventing birth defects, premature birth and infant mortality. Offers educational materials for expecting and new parents about these concerns. For specific information about local events, visit the website or the March of Dimes Michigan Facebook Page. Description: The MSU Student Parent Resource Center (SPRC) provides support, resources, campus and community connections for all MSU student parents through graduation and beyond. Services Offered: SPRC provides a variety of services and supports for student families including advocacy for student families, academic and family support, financial assistance for child care (infant to age 12), Pre-finals child care, a Community Resource Guide, and more. The SPRC also provides parenting classes and workshops for parents on a variety of topics. Eligibility: Open to all MSU faculty, staff, and students who are parents with children (ages 1-12). Description: WKAR Education supports families, teachers and learners of all ages. PBS Learning Media – Your destination for easy, instant access to thousands of classroom-ready, digital resources. Free for educators. Teacher Line – High quality online professional development courses for PreK-12 teachers in Michigan. Ready to Learn – Works with community partners helping mid-Michigan families prepare children to become successful learners throughout their lives. Education Resource Connections – Agencies and information tied to education in mid-Michigan. Includes PBS Parents (Parenting resources, tips and advice, plus ideas for planning birthday parties & kids activities) and PBS Kids (A safe place for young kids to explore and play fun educational games with their favorite characters).